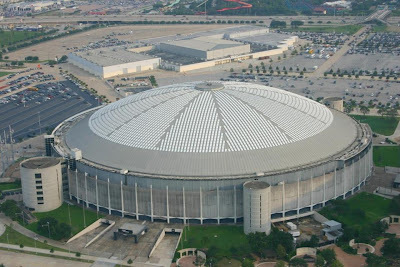 Harris County officials announced today a comprehensive plan to restore the Astrodome to its full functionality and grandeur by its 50th anniversary in 2015, and the NFL announced in parallel an agreement to have it host the 2017 Super Bowl LI. In addition, both professional teams that once played there will return, with the Titans returning from a failed foray to Tennessee and renaming themselves back to the Oilers (Houston will join NYC as the only two cities to host two NFL teams), and the Astros returning from an aging Minute Maid Park, including a return to those stylish rainbow uniforms (although it has not been announced at this time whether they will be playing major or minor-league baseball). Minute Maid Park will be converted into yet another convention center hotel to join the Hilton Americas, the Embassy Suites, the Four Seasons, the previously announced new hotel next to Discovery Green, and the Star of Hope - finally giving the GRB enough hotel rooms to compete in the convention big leagues. Although the Oilers will not be sharing a stadium with the Texans like the New York Giants and Jets do, parking constraints do mean the NFL will not schedule them with home games on the same day other than the days they play each other, which will be twice a year given that they will both still be in the same division, the AFC South. Bob McNair and Bud Adams have a tentative agreement on separate tailgating areas for such games. Rodeo Houston will also be taking advantage of the new venue to double its programming, offering separate concerts each evening in both the Astrodome and Reliant Stadium. Rodeo officials are thrilled now that they will have the opportunity to greatly expand their rap, DJ raves, and Justin Bieber concert programming. Still a great aerial shot of the Dome. It used to seem so huge! Remember that the only reason Reliant Stadium seems so much larger is that its field is at ground level while the Astrodome's field is 30+ feet below ground. Even if I could tell it was a gag, I was pretty excited for the return of powder blue and teal. You had me for a split second - a very happy split second.